Enhance your home today ! W J Richardson Glazing Ltd offer a variety of double-glazing installations, carrying out Double Glazed door and Double Glazed window fitting to the highest of standards in West Wickham, Kent, and surrounding areas. Read over our many testimonials to see what our customers have to say about us. W J Richardson Glazing Ltd have two teams of permanent fitters who carry out all of our windows, doors, and conservatory installations. Courteous and polite, with many years of experience, our installers are highly trustworthy and only use the finest quality products to guarantee the very best finish. Take advantage of our free no-obligation quotations today. We offer an in-depth survey of the work required, and give you tailored advice. As a family-owned firm, we don’t believe in high pressure sales, and we never subcontract. Second time we have used the company and both times have been successful. Work carried out to a high standard and reliable and friendly service. Picked from the Which? 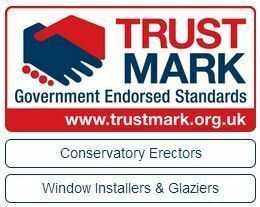 Trusted Traders list, WJ Richardson Glazing is one of six companies I asked to quote for replacement windows. Their friendly and helpful approach was clear from the start when measuring my windows and explaining how a problem window could be successfully replaced despite a pipe passing through the frame (some companies felt this was going to be difficult). My many questions were answered clearly and patiently when I visited their showroom shop to look at demonstration windows. Their quotation was the clearest I received, with each window priced individually, and a total price very similar to the other companies. There was no sales pressure at any stage and it was a pleasure to deal with WJ Richardson Glazing. Just a few weeks after ordering my new windows were installed with the team taking great care to achieve a very neat finish inside and out despite having to work in bitterly cold weather. All went well, including the difficult parts of the job, and I'm very pleased and impressed with the finished result. I'm very happy to recommend WJ Richardson Glazing. Excellent customer service. Very courteous, helpful staff. The work undertaken (replacement windows and door) was completed to a very high standard. Replaced a broken tile when the old window was taken out - resolved satisfactorily. Aftercare was offered should the need arise. Use this firm with confidence. The replacement conservatory was installed in a professional manner by a very experienced team who took a great deal of pride in a job well done. The work was very neat and resulted in a product that we are very pleased with and was done at a competitive price. The team were very helpful and nothing was to much trouble. We have since had the three windows in the front of the house replaced and again we could not fault the workmanship. When the team were giving the windows a final clean they noticed that one window had a blemish inside the sealed unit. This was reported back to the office and a replacement window is on its way. A good aftercare service Once again a very professional job carried out by friendly installers. Two great jobs, thank you. In my opinion, this company’s windows are ‘not fit for purpose’ (sub-standard) under the requirements of consumer law (the sale of goods and services Act/s). This company refuses to fulfil its obligation to ‘repair or replace’ the faulty windows they supplied and installed as required by consumer law. (the sale of goods and services Act/s). By its own admission this double-glazing company refuses to cover or include glass under its warranty/guarantee. At the point of sale this company claims to provide within the price a 10 years insurance backed warranty/guarantee but fails to provide one. This company has refused to honour the obligations of its ‘own’ 5 years warranty/guarantee when called to do so. Contrary to their responsibilities under consumer law this company tries to back off any warranty claims to its manufacturers. Contrary to their responsibilities under consumer law this company claims they cannot fulfil their warranty obligations when a manufacturer goes out of business. Unknown to its customers this company installs toughened glass where it is not necessary and by doing so increases the price by approx. 25%. I have no hesitation in recommending W.J. Richardson Glazing LTD. Great couple of guys who did the work and very knowledgeable about what was required when putting up our conservatory. Front of house bay windows. Price quoted is price paid. Very professional. Very pleased with final product. Good communication. Excellent customer service, no fuss. Job done really well. We had building works going on too that impacted on the windows, this caused complications. WJRG made this easy to deal with. Efficient, excellent work standard. Friendly and tidied up after completion.